Hybrid (3dB) quadrature couplers are used in most reflection-style phase shifters. Quad couplers can be realized as branchline couplers (distributed or with lumped elements), Lange couplers, or other coupled line couplers of many varieties. 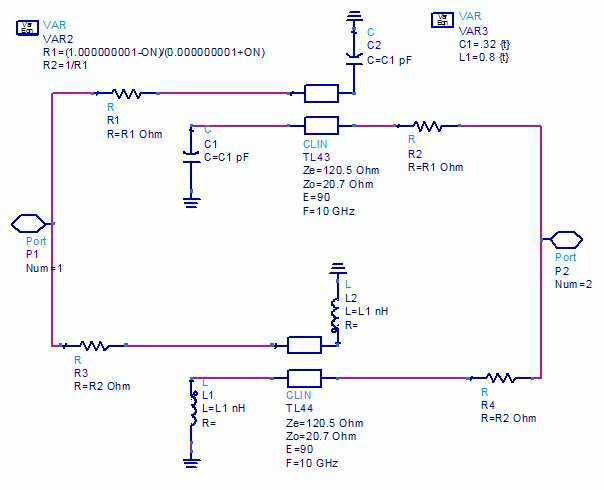 The bandwidth of the quadrature reflection phase shifter is mostly limited by the choice of coupler, you can achieve an octave with many coupled-line coupler structures. In terms of bandwidth, the best quadrature coupler (but hardest to make) is a broadside coupler in stripline, the worst is a branchline on microstrip (the easiest to make). Quadrature hybrids are often used to create reflection phase bits. 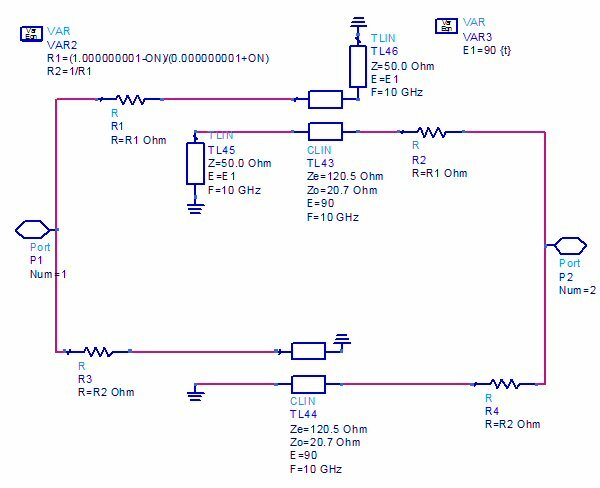 The simplest bit to consider is shown in the ADS schematic below. The resistors R1 and R2 are used to create a two-state device from the upper and lower ideal couplers in the simulation (when ON=1, the upper coupler is selected, when ON=0, the lower one is selected). 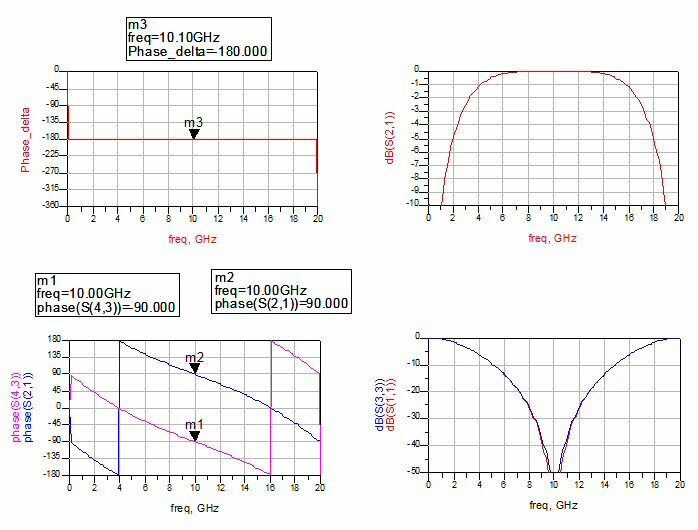 The even mode and odd mode impedances have been selected to provide perfect 3.01 dB coupling at the center frequency (10 GHz) for 50 ohm system. The upper coupler has open circuits on the power split ports, the lower coupler has short circuits. Note that in each state, it is important to present the same impedance to each power split port to get the power to transfer out the normally isolated port. 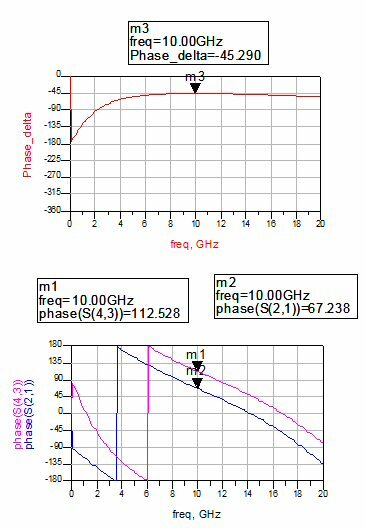 The phases of S21 and S43 are the phases of the two states in this simulation, and they are exactly parallel over frequency as shown below. Thus 180 phase shift is provided exactly at all frequencies in this (ideal) situation. The bandwidth of the ideal coupler restricts the approach to perhaps one octave. US Patent 5379007 uses this scheme. so does 4764740. Here's the response. It has the same S-parameter magnitudes of the previous example, but the phase shift is now linear with frequency. 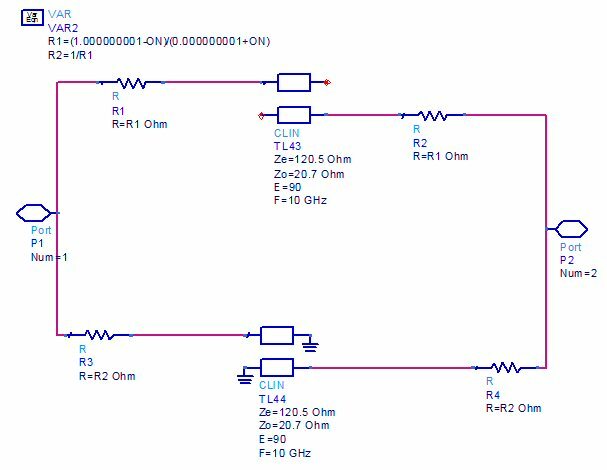 This is going to give you a very narrow-band response in terms of phase errors, and should be avoided. 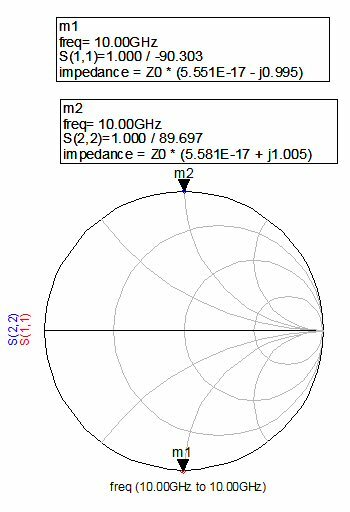 Here's the response of these two elements at 10 GHz, plotted on a Smith chart. They are 180 degrees apart, the capacitor is at -90 degrees and the inductor is at +90 degrees. What if we used these as switchable terminations in a quadrature reflection phase shifter? Flat phase shift is provided. The mojo is back! 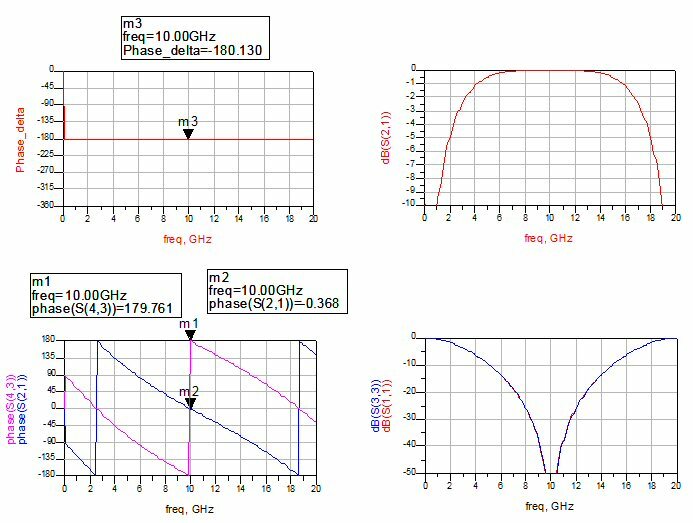 You can create any value phase shift with lumped elements, and the phase shift will stay relatively flat over frequency (but not as perfect as the 180 degree case). 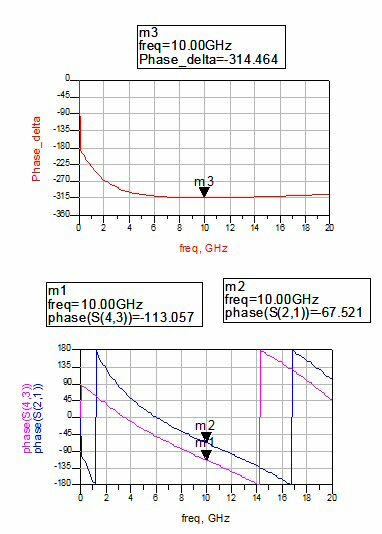 Below are two tables for element values to achieve phase shift at 10 GHz, you can scale them to any frequency you want. The values are approximate, we didn't spend the time to derive the closed-form expression, if anyone wants to help us out we'd be happy to give you credit and a pocketknife for the correct formula! It turns out there are two solutions for each bit value. For a 90 degree bit, you can either choose the -45 and +45 values, or the -135 and +135 values. For a 45 bit, you can choose the -22.5 and +22.5 values, or the -157.5 and 157.5 values, and you can do the math yourself for 22 and 11 degree bits. Be aware, you should keep the phase shifts of the inductor and capacitor equal for best results.